After a decade of losing and a lifetime of obstacles, Paul Pierce finally vanquished his doubters and his attackers by winning on the court and growing up off it. As the night winds down and the TV cameras and most of the A-list athletes and C-list celebrities have left, Paul Pierce makes his way out of the VIP room, its crimson walls covered with flat screens playing an endless loop of his late-night talk-show appearances. The hip-hop on this November night is still thumping at Kings, in the Back Bay, which is either supposed to be a bowling alley dressed up as a nightclub or a nightclub dressed up as a bowling alley. But for the first time during his charity bowl, Pierce has managed to break free from the coterie of female handlers and event planners who've been covering him better than Kobe or LeBron ever did, all the while furiously thumbing on their BlackBerries with the urgency of National Security Council staffers arranging a crisis briefing. Wearing a black, military-style commando shirt that accentuates his career-best physique, Pierce is heading back to the lanes when he spots a tall white-haired gentleman carrying a bowling bag the same shade of tan as his slacks and walking alone toward the exit. Pierce pivots and heads over to the ruddy-faced man. Wrapping his arm around him, Pierce smiles and says in his raspy voice, "Thank you so much for coming, Mr. Havlicek." John Havlicek's eyes light up behind his boxy glasses. He sets down his bowling bag and returns the hug. It's a small moment. But it's more telling than the hug they had shared a few weeks earlier. On October 28, over the cheers of a packed Garden crowd, Havlicek handed over the NBA championship trophy to Pierce before the Boston Celtics' 17th world-title banner was raised to the rafters. That moment was genuine, too, of course. No one without a SAG card can cry as uncontrollably as Pierce did during the banner-raising ceremony without it being genuine. But that exchange was also impossibly portentous and public. Havlicek, an undisputed legend who helped secure eight of those 17 banners, was officially welcoming Pierce into the club. In contrast, this moment in the bowling alley was quiet and, as far as they knew, unrecorded for posterity. After his 10 long, mostly lean years as the face of the franchise, when all those banners looked down on him, a burden more than a benefit, Pierce was telling Havlicek how honored he was to have been granted admission. "I respect our greats. I admire them," Pierce tells me later. "Now I'm part of that." The 31-year-old laughs when I ask him if he expects the rest of us to address him as Mr. Pierce now. After all, it wasn't too long ago that he was known as much for his hotheaded moments on the court and his clubbing ways off it as he was for play so dazzling it would earn him the NBA Finals MVP trophy. But through all those years, he never stopped playing hard, never faked injuries like other high-salaried star athletes in this town who need not be mentioned by name (Manny), and never gave up on his community involvement or his ferocious desire to win. For his pivotal role in bringing green glory back to New England and for his perseverance through a decade when that seemed like a hopeless cause, he is our Bostonian of the Year. We've seen him grow up right before our eyes, and it hasn't always been pretty. But in 2008, when the championship was only the capstone to a transformative year that made him a father and gave him new insight into the long-buried pain he felt as a son, we finally got to The Truth. Going into the 10th grade, Pierce wanted nothing more than to play varsity ball. He'd played JV his freshman year and barely got off the bench during summer league play. His friends told him he should be a starter. This is what high school ballplayers tell one another. So he transferred. He left Inglewood High School, down the street from where the Los Angeles Lakers played, and enrolled at nearby Crenshaw High. His mother and his two brothers were having none of it. Jamal Hosey was older than Paul by 14 years, Steve Hosey by eight. They had a different father than Paul, but were brothers just the same. Their mom, Lorraine Hosey, had raised all three of them on her nurse's salary. And because the two older boys had used sports to avoid the minefields of their neighborhood and get to college on scholarship, they were Paul's role models. They never worried about their little brother's toughness. Once when Jamal put 6-year-old Paul in a headlock and demanded he cry uncle, the boy shot back, "You might as well just break my neck now, 'cause there's no way I'm gonna say uncle." But they did worry about his decision making. 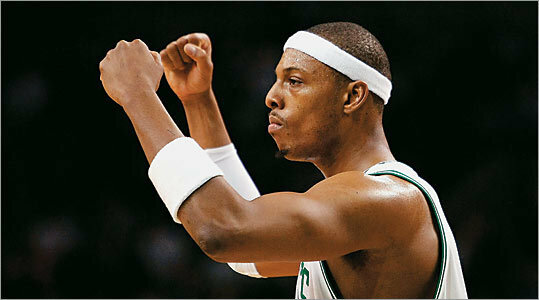 "I came to a bump in the road, and my first instinct was to try to go around it," Pierce says now. "They encouraged me to face that bump and try to go over it." Two weeks later, he transferred back to Inglewood High. Flash-forward to the spring of 2007. Pierce had been with the Celtics for all nine of his NBA seasons. He'd seen players, coaches, and owners come and go. When Doc Rivers took over as coach in 2004, he'd demanded that Pierce, an All-Star, change his style of play. After half a season of shooting icy stares at his new coach, Pierce relented, agreeing to pass the ball more to all the untested young players around him. And where had it gotten him? When Pierce went down with an injury, he was forced to watch from the bench as the storied Celtics became an NBA joke, losing 18 in a row. His friends were telling him it would never happen for him in Boston. If he wanted a ring, he'd have to leave. He and his agent called a meeting with managing partners Wyc Grousbeck and Steve Pagliuca and general manager Danny Ainge. "I went into that meeting with a lot of fear," Pagliuca says now. "We didn't have a vision for winning here without Paul." But during the meeting, Pierce took the tack of the GM he hopes to be after he retires. A high draft pick at the end of the losing season could bring a title several years down the line. But that would be too late for Pierce. "If I was you all," he told them, "I'd take the pick and trade me for some other young pieces, and you've got your foundation." The owners shot that down. Ainge vowed to find Pierce help, and the partners vowed to pay for it. The assurances were enough for Pierce. To the relief of his family once again, he faced that bump in the road head-on. Ainge then engineered the trades that replaced youthful promise for All-Star experience in the form of Ray Allen and Kevin Garnett. "The worst thing that could have happened for Paul was to get traded," says brother Jamal. "He didn't want to leave Boston as a loser." BEFORE THIS YEAR, PIERCE didn't know many perfect days. That had less to do with winning and losing than with how he defined perfection: being at practice. "The gym was my sanctuary," he says. "The place where you could forget about all your worries, your problems, people asking you for money, people asking you to do this, do that." Still, practice lasted only so long. This year, his definition of perfection changed. "Now it's lying on the floor with my daughter, rolling around, playing with her. When she looks at me and starts smiling, I forget that I went 0 for 15, or I lost the game." Prianna Lee was born eight months ago. Pierce's fiancee, Julie Landrum, had been set on the name Piper, until Pierce came up with Prianna. Pierce and Landrum began dating during All-Star weekend in Houston in 2006. Both Pierce and his family credit her with helping bring stability to his life. "He's just a much more settled person," says brother Steve. "Now," Jamal says, "he prefers to be around his family rather than his boys." Will there be a wedding soon? Pierce, who was engaged once before, doesn't hesitate. "Oh, definitely," he says. "We plan on going to marriage counseling this summer, and shortly after we do the counseling, we plan on doing that." When he cradles Prianna in his arms, the troubles of the day magically go away, but he can't help but ponder the biggest unanswered question from deep in his past: Why did his father, George Pierce, walk out of his life when Paul was just a few years old and never come back? "It's crazy," he says, "how people just don't care sometimes about the kids they have." When Pierce was a college star at Kansas, he received a letter from his father's sister, saying she wanted to help him. Pierce was widely predicted to be a high lottery pick in the NBA draft. "At the time, you got so many people coming at you. They want to give you gifts, want to do things for you," he says. "And she was just one of them. I felt that was his way of using her to creep back into my life." Pierce ignored the letter. He didn't need any help then. In September 2000, when Pierce was attacked and stabbed nearly to death after an argument at a Boston nightclub, his family rushed to his bedside at what is now Tufts Medical Center. (He would later help fund the hospital's Center for Minimally Invasive Surgery, which bears his name.) Cards and phone calls poured in from around the country. But nothing from his father. "That's what hurt me the most," Pierce says, his eyes filling with tears that somehow manage to stay in. "Not hearing from him at all. Like it didn't matter if I had died or not." He finds himself wondering how his life might have been different if his dad had been involved in it. For the first time, his father is helping serve as a model -- but not in the usual way. "I want to be the dad that my father never was." WHEN PIERCE WAS IN THE ninth grade, Magic Johnson drove past him in his black Mercedes with tinted windows. Magic didn't see Pierce, but Pierce saw him. "I was like, Dang! I got all excited, just because I got a glimpse of him." Pierce, who now drives his own Mercedes -- white, with tinted windows -- thinks about that experience whenever he talks to kids. "Going into a classroom, you know they're going to listen," he says. "If my mom had told me, 'You go to school and you can be president,' I'd be like, 'Yah.' But if Magic had told me, I'd be like, 'For real?!' "
The charity bowl in November was the official launch of his new health initiative aimed at reducing obesity among inner-city kids. It was also a relaunch of Pierce himself. After a decade of viewing him as the embodiment of unrealized potential, of towering talent that could somehow never measure up, it was finally possible to envision Paul Pierce as a Celtics Legend of tomorrow. Close your eyes, and you can picture him with gray hair, attending the charity event of some as-yet-unborn Celtics star, doing his best to groove to another generation's music as the 68-year-old Havlicek had done earlier in the night, when he wasn't trading fist-bumps with the 20-somethings crowded around him. Neil Swidey is a staff writer for the Globe Magazine and author of The Assist: Hoops, Hope, and the Game of Their Lives (theassist.net), now in paperback. He can be reached at swidey@globe.com.